Come one, come all to the best little fly fishing show around: the CFFA Expo at Maneely’s in South Windsor, CT, Saturday, February 3 from 9am-3pm. You can find me on Fly Tyers’ Row, and as always I’ll be ready to answer questions or just hang out and talk fishing. I’ll be there through 1pm for sure, as we’ll be celebrating Gordo’s birthday later in the day. You can find the Expo details here. I’m not sure what I’ll be tying, but the Magic Fly (AKA Pale Watery wingless variant) is always a crowd favorite. I’ll do my best to accommodate requests, time and materials permitting. The official start of summer isn’t beholden to calendars or warmth or maximum daylight. For me, it begins with liberating my cane rod from the confines of its storage tube and tying a Magic Fly to the end of a 12-foot leader. That this all happened on the 21st of June was a happy coincidence. Monday’s storm left a swath of destruction in the People’s Forest area. Downed trees and limbs everywhere. The river soared a few hundred cfs, and Grady Allen told me the action Tuesday night was not so good. When I drove through New Hartford yesterday, the roads were wet and steaming from a late afternoon squall. Random piles of hailstones in the woods made me glad that I missed it. The river was down to 450cfs, but still carried a stain and some debris. Not a lot in the way of catching for me, but I did get a low teens wild brown to hand on a size 18 Usual. 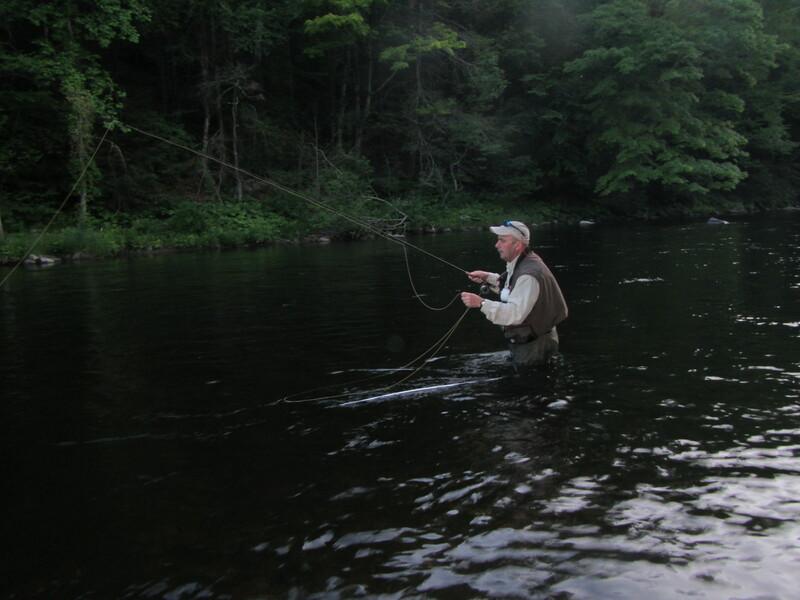 I also rose fish to the Magic Fly size 18, Catskill Light Cahill size 14 and 16, and size 10 Convertible (look it up). To the strangeness. Nothing so odd about the hatches proper: Sulphurs came off like clockwork and 5:30 and 7:30, first the bigger size 16 mayflies, the size 18s following, with the usual 6:45-7:00 lull. A few caddis and Isos here and there. The hatch strength was average. Normally this time of year, the Farmington lights up from 8pm to dark. Last night it was a dimpled surface wasteland. 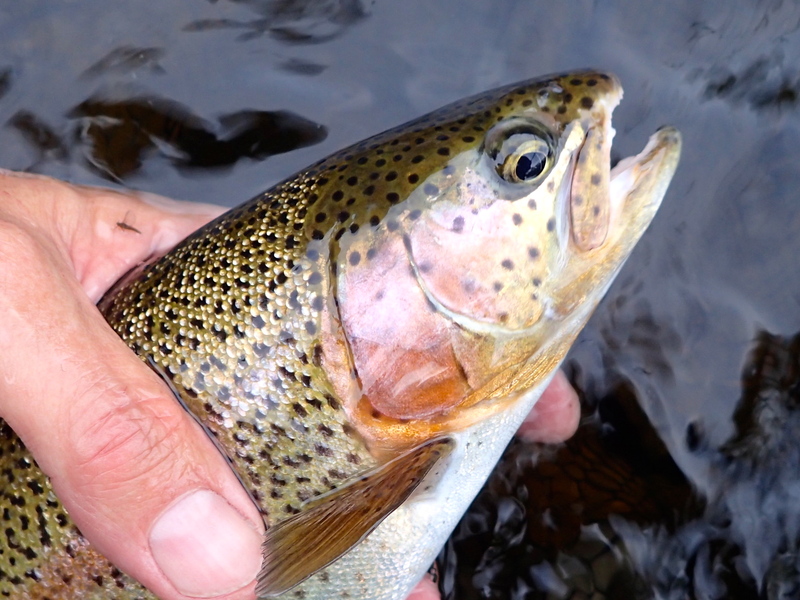 No spinner fall, no straggler hatch, no water boiling with feeding trout. How bad was it? I counted seven total rises during the witching hour (I might expect to see that many in 30 seconds on a good night). I finished the evening by tossing a size 4 Olive Zoo Cougar into the gloaming. A few bumps and one stuck fish, but that’s not a fly made for cane. Welcome, summer, even if your entrance was a little oddball. 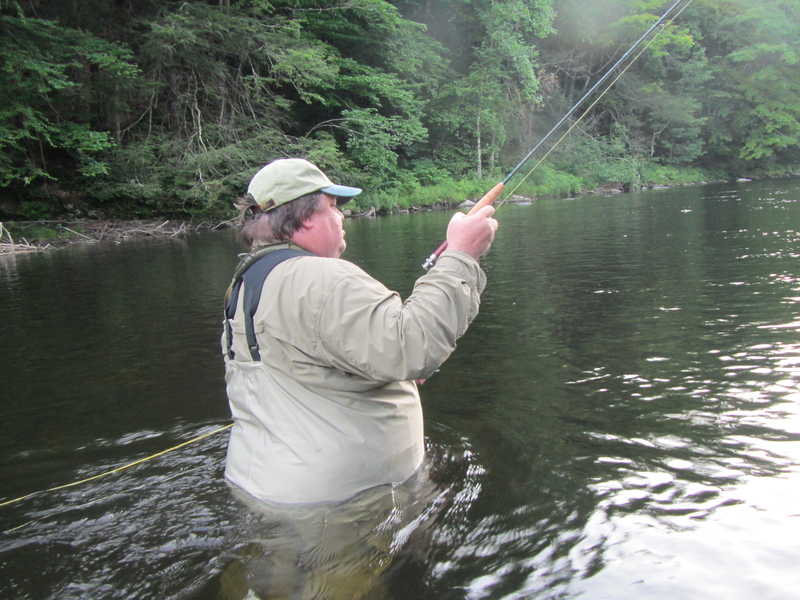 Want you to know that I just caught a monster brown, at the Delaware river, on one of the flies that you tied for me. Size 18. My guess is 24+”. No, Keith. Thank you. And well done! In proper nomenclature, these would be Pale Watery wingless wet variants. I think, however, that Keith would cast his vote in favor of calling it The Magic Fly. Those of you old enough to remember the classic 1960s series on prime time — or young enough to know it through syndication — are familiar with the show’s schlocky fight sequences, complete with comic-book graphics: BAM! POW! OOOFF! Hold that thought for a moment, please. I got to the river at 6pm last night, and I quickly learned two things. 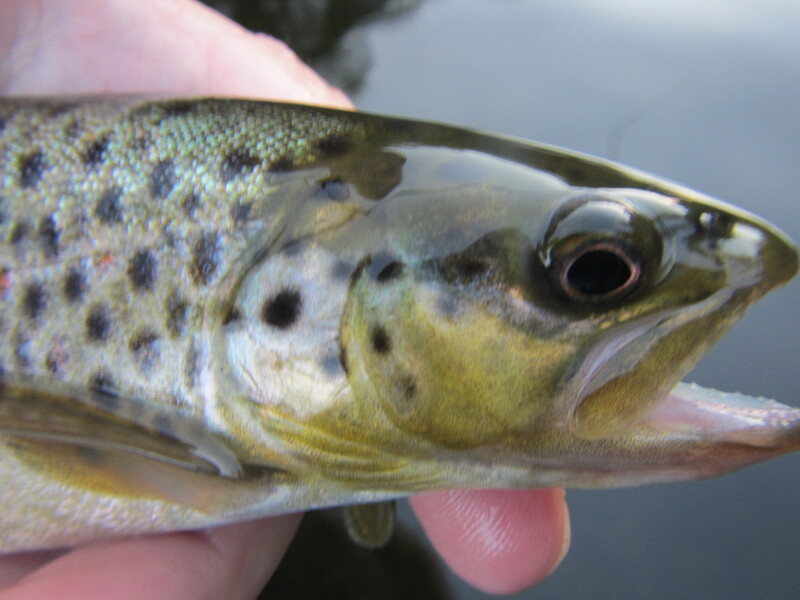 One, one of my favorite wet fly runs that might produce one or two fish in the daytime is infested with feeding trout in the evening. And two, I can enjoy it in glorious solitude. Save for the cedar waxwings. 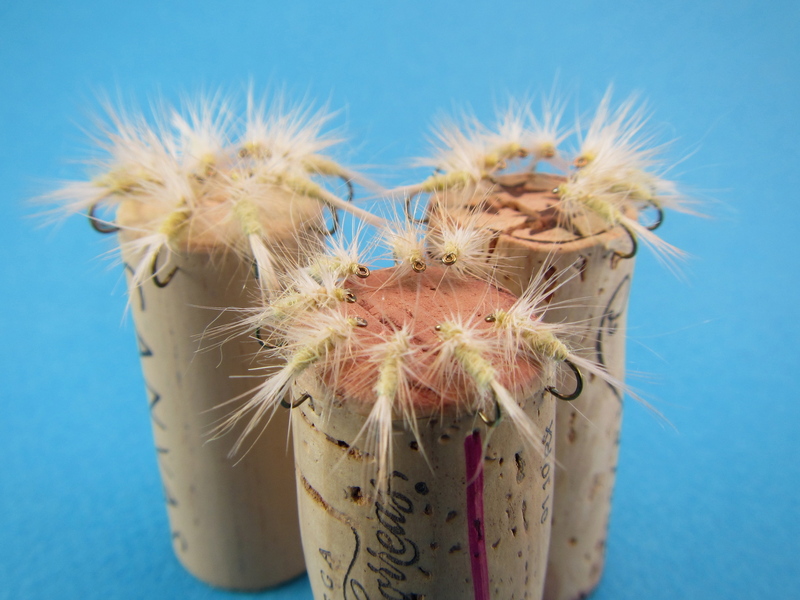 To the hatch: sulphurs (16-18), caddis (16-18), Isonychia (10-12), and BWOs (18). Midges, of course. Then a tremendous sulphur spinner fall at dark. Feeding came in waves; seemingly long periods of nothing followed by five minutes of boiling water. Every fish I took was an active feeder. Back to Batman. Remember my last report of fish rising to my flies and coming away with nothing? Not last night. These were some of the most aggressive rises I’ve seen in a while. Acts of pure hostility that kept me delighted beyond measure. 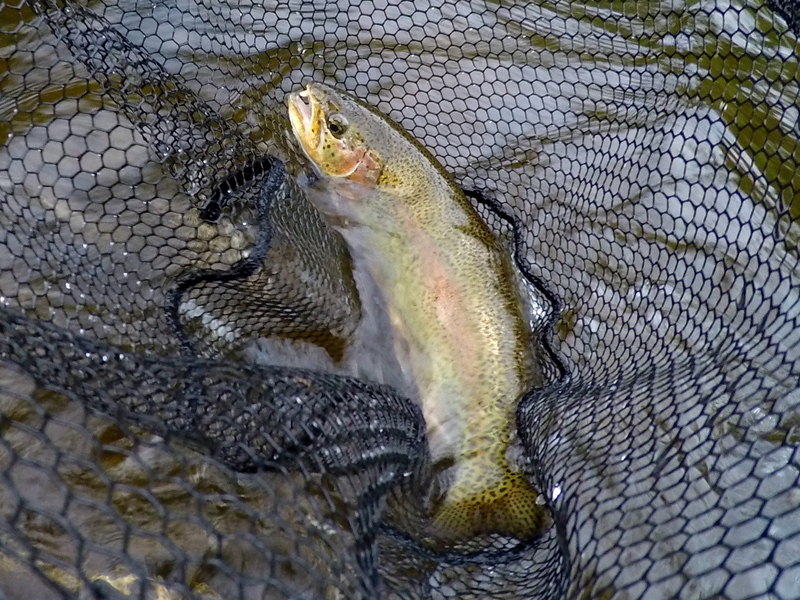 Many of the trout were fat, mid-teens rainbows. One was the smallest wild brown I’ve caught on the Farmington. Another was its polar opposite. This guy absolutely murdered my size 16 Magic Fly. One tremendous leap, then the fish tore downstream like he was late for a job interview. My cane rod is outfitted with a click-and-pawl reel — there’s no rim to palm — so the only drag is my fingers on the line. I applied pressure at the end of his second run, then (to borrow from Batman) PLOINK! Popped the tippet. Now, 6x Frog Hair paired with the forgiveness of cane should be able to handle most Farmington trout. I have no doubt that the loss was a result of compromised material — or the misfortune of nylon wrapped around fin. I fantasized about re-catching him and getting my fly back, but I knew that would be an unrealized dream. A closer look at this bruiser’s mouth reveals that this isn’t his debut with a hook. What the Isonychia hatch lacked in numbers, it made up for with gorging trout. It was very much like a good Hendrickson hatch, with dozens of reckless fish lacerating the surface with showy takes. Between 8pm and about quarter past, the pool was strangely quiet. I had just made the decision to move to another spot downstream when the spinner fall commenced. I moved into some water with a smoother surface, and had at a multitude that were still taking emergers and gently sipping. I stuck my last brown at 9:15pm, when I could no longer see the fly. All I could say was, WOW! Excuse me sir, but is that a Pale Watery wingless wet in your mouth? Notes: Flies I caught trout on: size 16 Pale Watery wingless wet, size 16 creamy Usual, size 12 grey Usual, size 10 Isonychia Comparadun, size 18 and size 12 Light Cahill Catskills dry. Jefferson, a former wet fly student, made this report from the permanent C&R section: I had an excellent evening. I was fishing wet blue wing olives, size 12 and size 16. Everyone else thought the fish were hitting sulphur spinners (cus it was evening and it was sulphur season, perhaps?) One of the beauties of fishing wet right at dark is that one doesn’t have to obsessively try to see the fly on the darkening water. All you have to do is watch the line and have a general idea of where the fly is. Would that it were so. But for now, I’ll have to be content with two dozen of the Magic Fly (Pale Watery wingless wet) sizes 16 through 20, waiting in the wings. June still seems like a long way off. But you can never have too many sulphur emergers — especially the Magic Fly. If you’re new to this pattern, you can find the recipe and a tying video on this site. You’ll be glad you did. I’ll drink to a warm June evening when the sulphurs are coming off in numbers and the trout are getting stupid. I also see we’re getting near the 300 followers mark. Of course, once we reach it we’ll do another fly giveaway. Coming soon: another trout streamer. Think out-of-the-box.